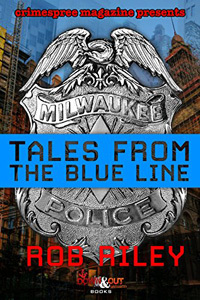 Tales from the Blue Line by Rob Riley is the first in a new series of “Crimespree Magazine Presents.” This is a compilation of twenty-nine separate police investigations conducted by Rob Riley and his partners, while they were Milwaukee Police officers. Riley was sworn in as a police officer in 1971 and retired as a detective in 2001. His career was unique even from the beginning, when with only a few months on the job he was recruited to be an undercover narcotics officer. After seven extremely intense years undercover and one year in uniform, Riley was promoted to the rank of detective where he spent the rest of his career. From purchasing illegal drugs from people on the streets to executing nearly a hundred search warrants, his time in the Narcotics Squad seemed like more than a lifetime of police experiences. Twenty-two years as a major crimes detective, Riley connected with high ranking officials in the District Attorney’s office, as well as some of the most highly regarded defense attorney’s in the country. He was a private investigator for two years after his retirement.